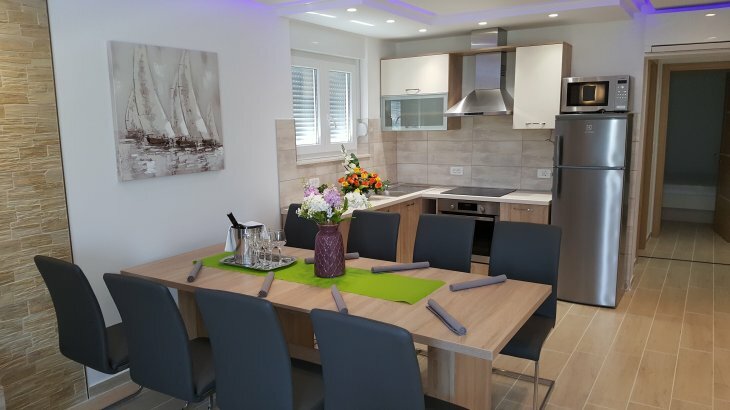 Luxury apartments, houses, rooms,accommodation with or without breakfast ... bed and breakfast for your family or accommodations for larger groups. 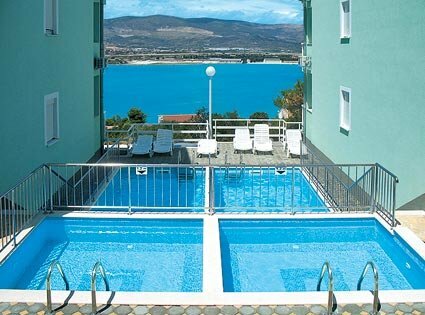 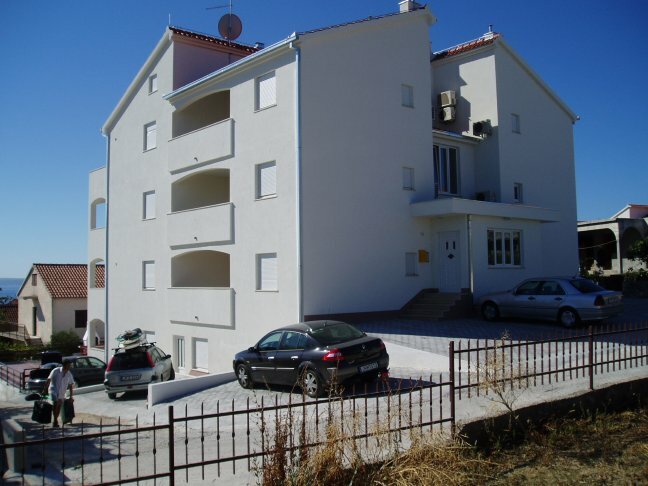 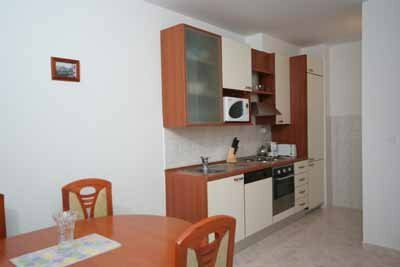 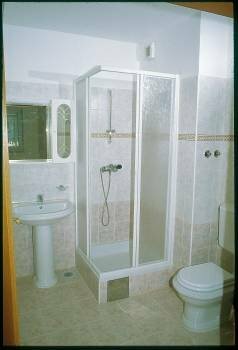 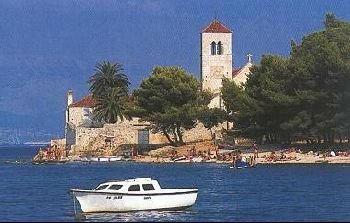 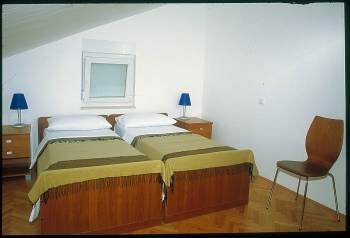 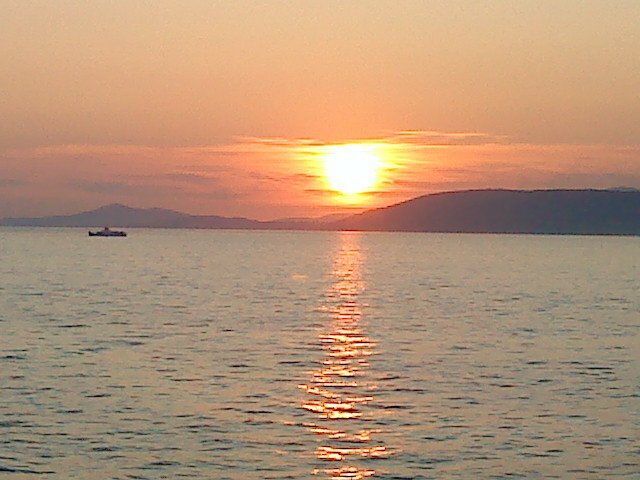 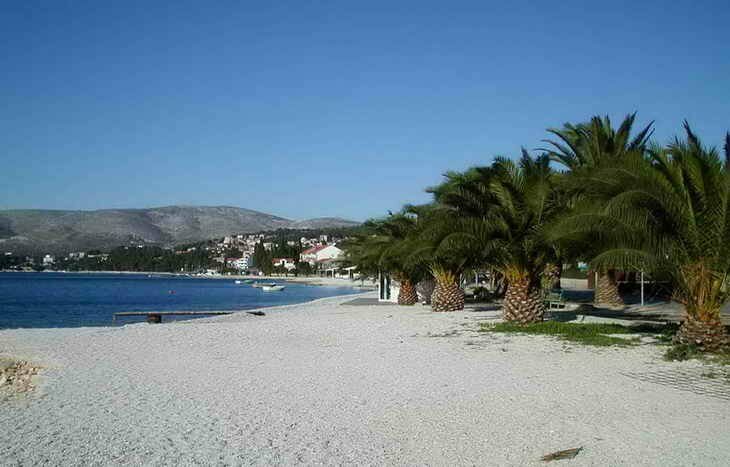 Close to the airport, on the beach or the pool ... Accommodation in Trogir on Ciovo, Dalmatia! 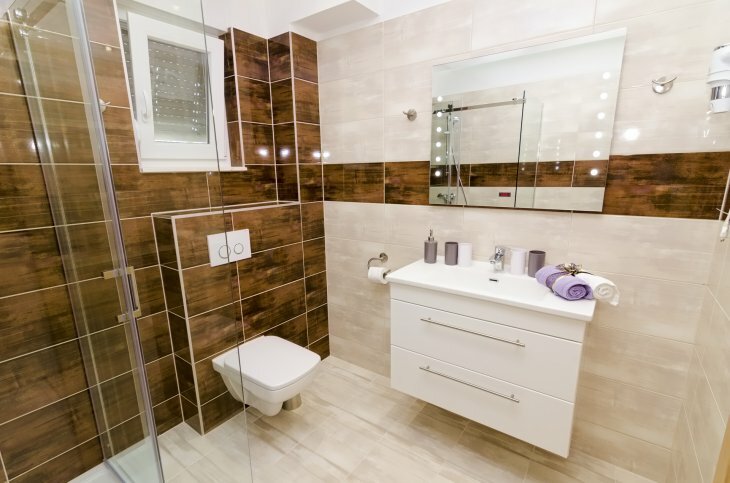 Contact us with confidence. 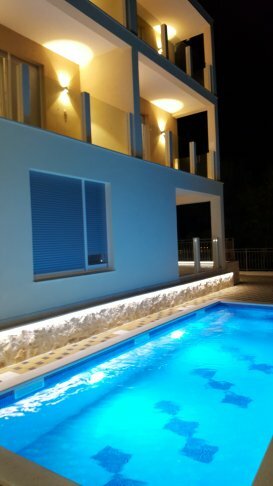 Welcome to the island of Ciovo, in the newly built Villa Bayview *** with swimming pool. 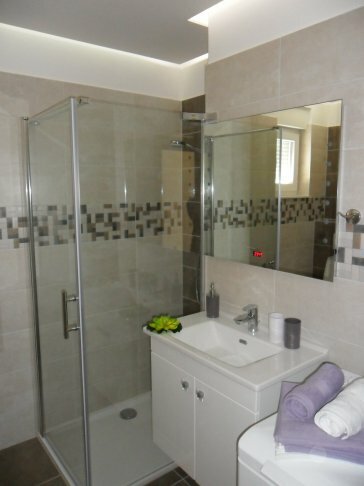 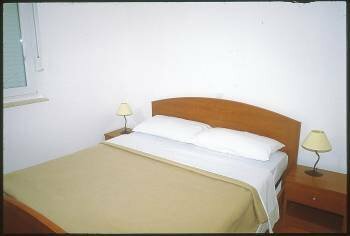 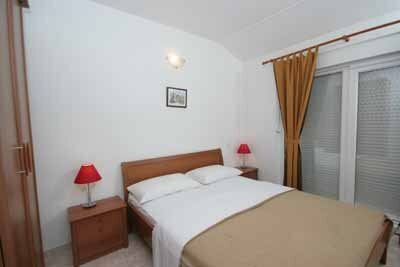 Accommodation is in comfortable and modern apartments. 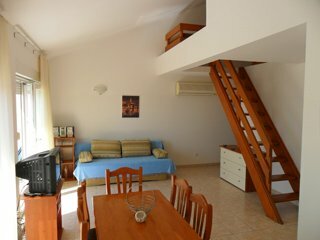 One bedroom apartments are 50m2 and two bedroom apartments are 70m2. 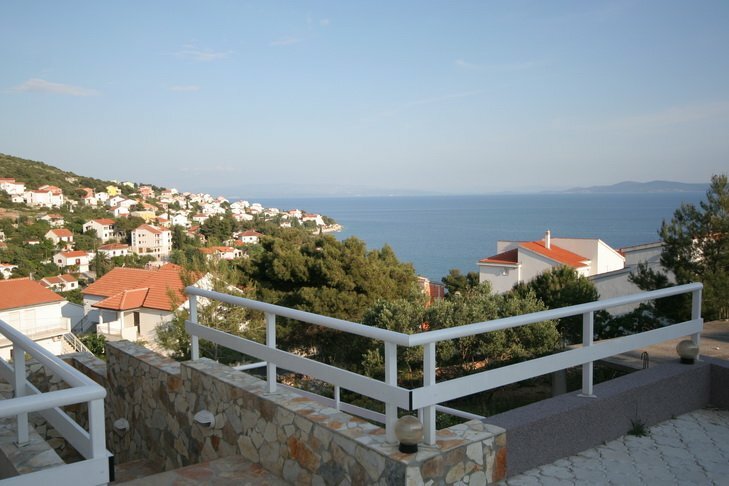 Villa Bušinci *** with swimming pool located on the island of Ciovo, is newly built. 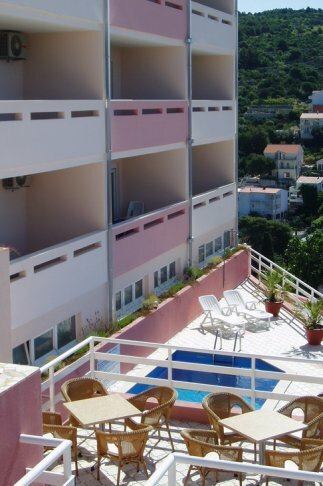 Accommodation is nice for families and groups to max. 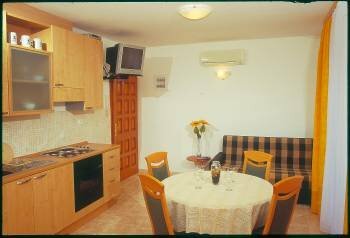 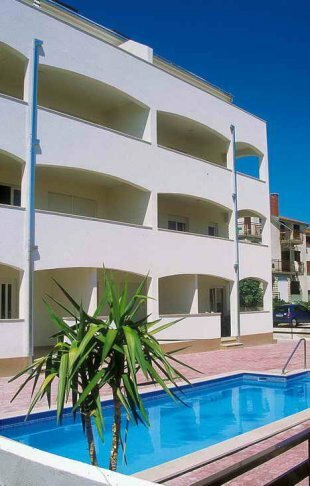 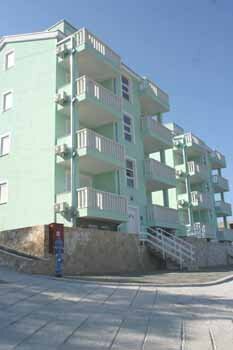 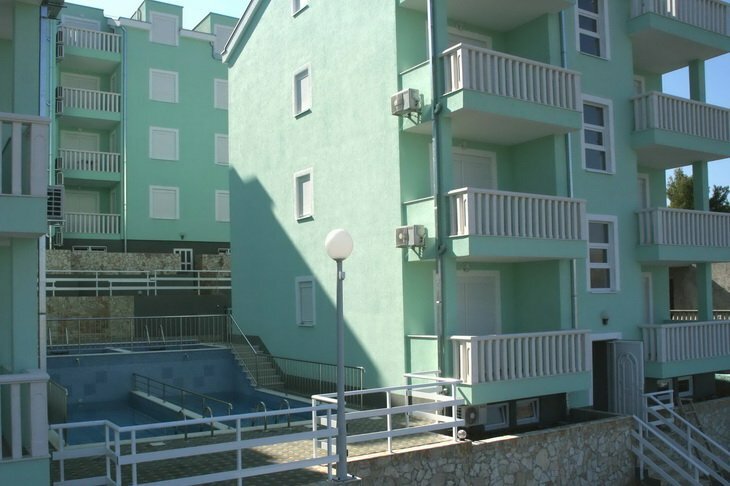 40 persons very comfortable and modern apartments. 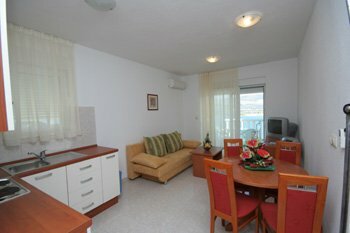 One bedroom apartments are 50m2 and two bedroom apartments are 90m2. 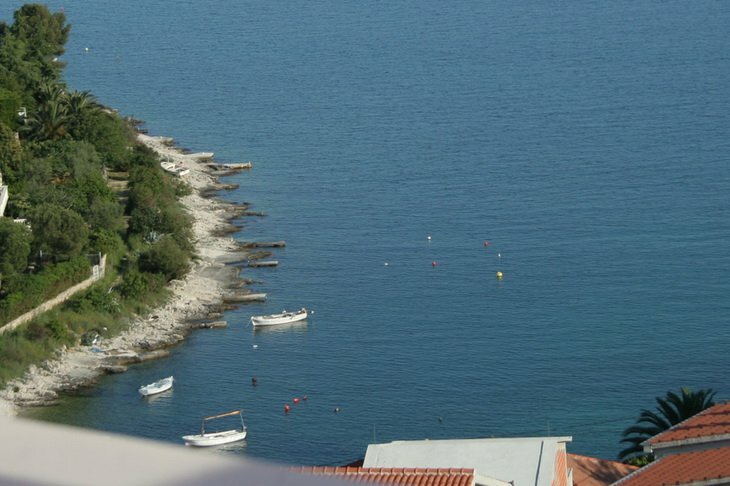 New built luxury Villa Mavarčica **** with swimming pool located on the island of Ciovo. 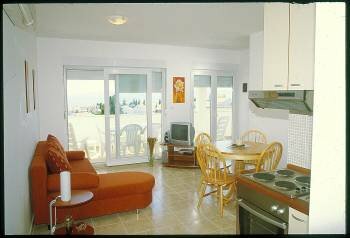 Accommodation is nice for families and groups to max. 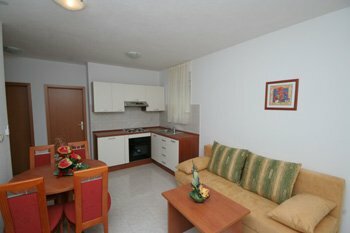 40 persons very luxury comfortable and modern apartments. 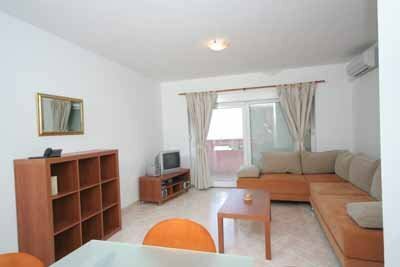 One bedroom apartments are 58m2 and two bedroom apartments are 90m2. 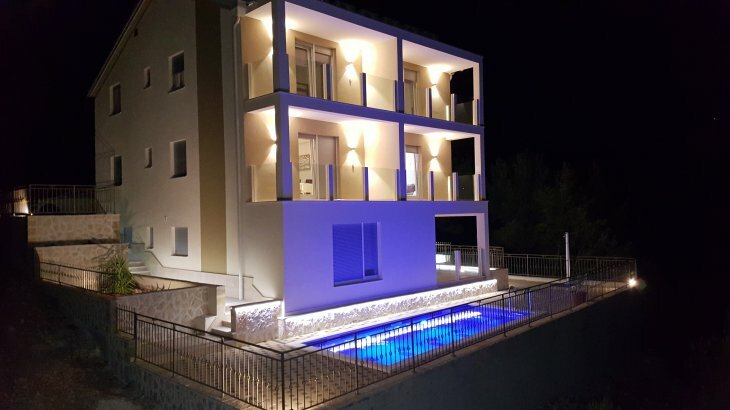 If you want to treat yourself to something special, choose Croatia as your holiday destination, and the new, luxurious villa “Star Lights” as your accommodation. 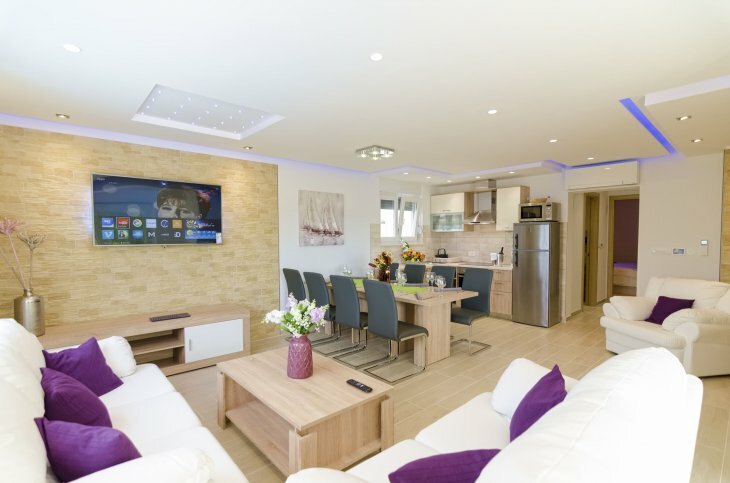 This holiday home boasts an interior polished to the smallest details and a lovely yard containing a private swimming pool and whirlpool, situated in pleasant surroundings. 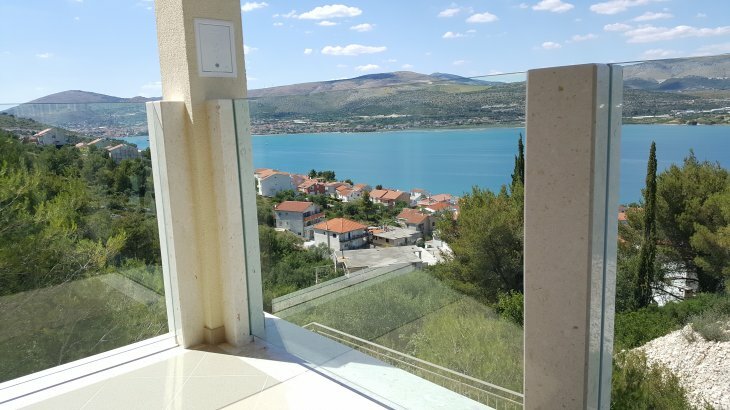 Relax next to the beach and enjoy magnificent sea views in the tranquil atmosphere of pristine nature – and with the historical centre of the city of Trogir still easily within your reach. 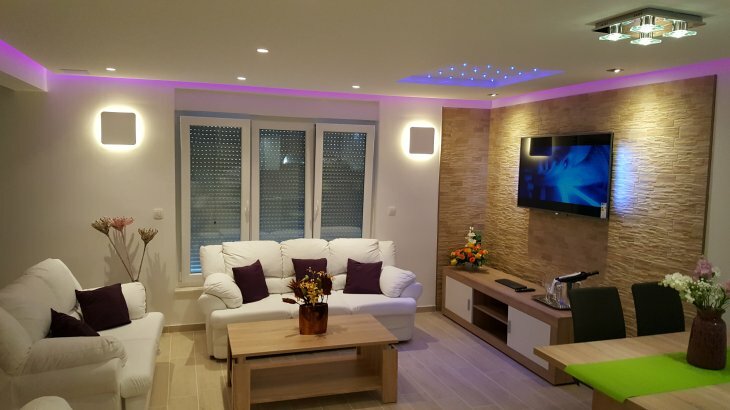 This fantastic seven-bedroom villa can accommodate up to 14 people and is the perfect choice both for a quiet vacation far away from the hustle and bustle and for a holiday filled with fun activities and exciting night life. 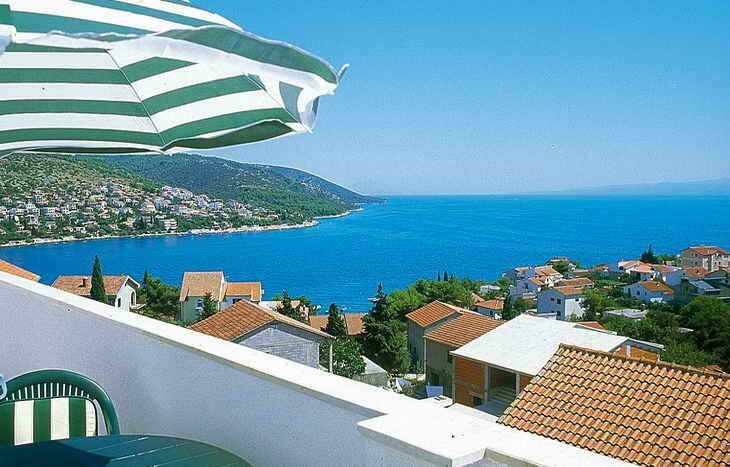 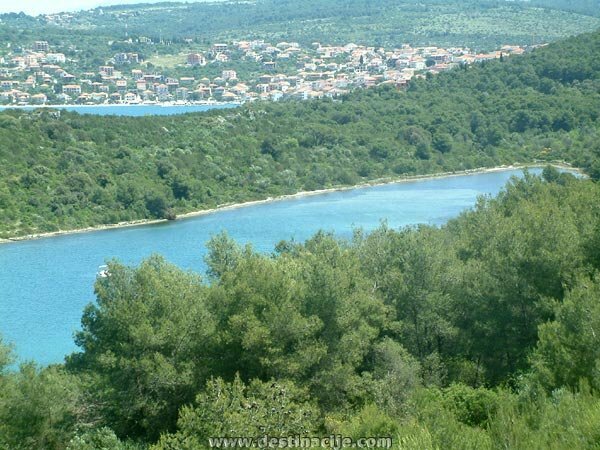 The villa is situated on the island of Čiovo, connected to the mainland by bridge, which makes the island easily accessible at any moment. 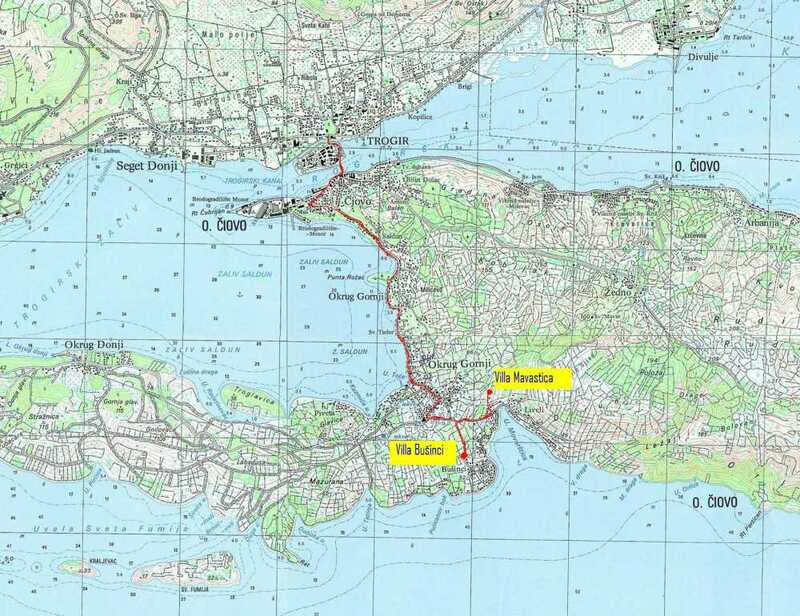 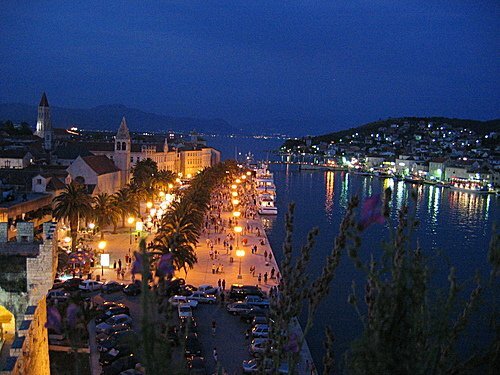 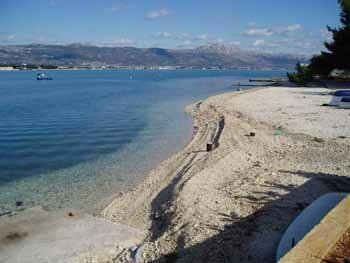 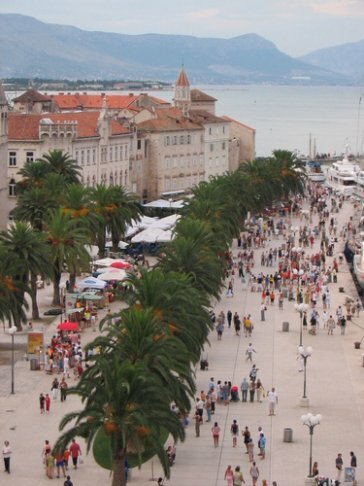 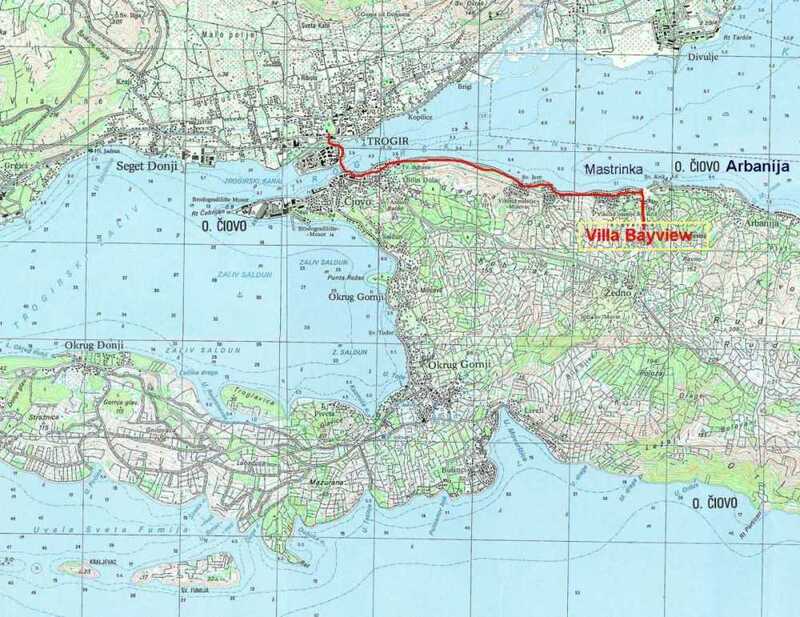 The closest beach is 400 metres away while the distance from the city centre of Trogir is 3.5 km. 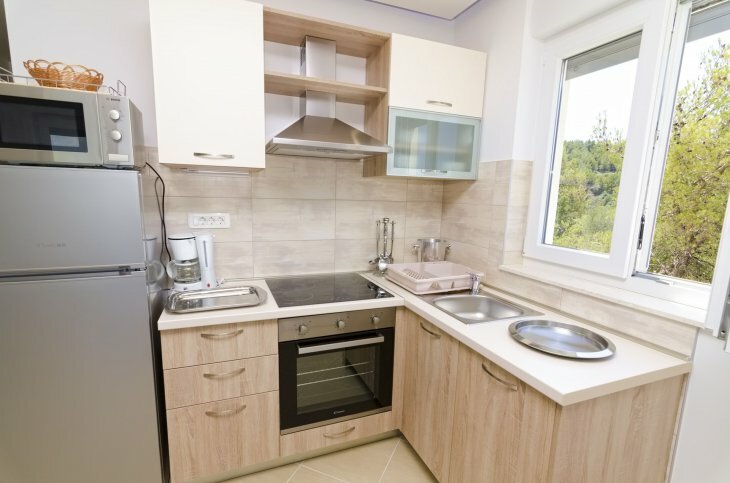 The city centre contains all the amenities you will need for a carefree vacation – stores, souvenir shops, restaurants, bars, a pharmacy, a post office and nightlife establishments. 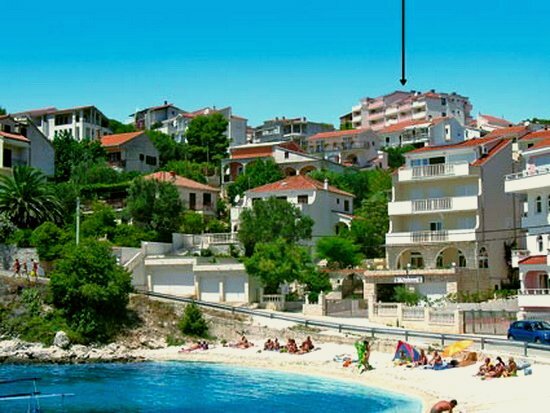 The closest beach is located 400 m from the holiday home and offers pedal boat, kayak, jet ski, bike, scooter and quad rentals, among other things. 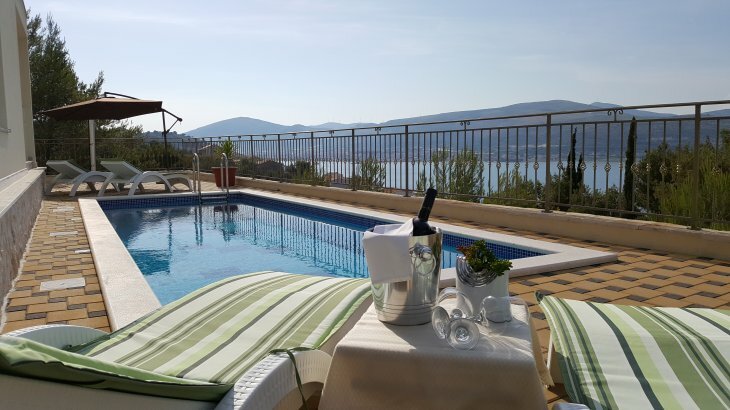 The yard of the villa features a private pool with whirlpool and sun loungers, a relaxing garden swing, a barbecue and a solar shower. 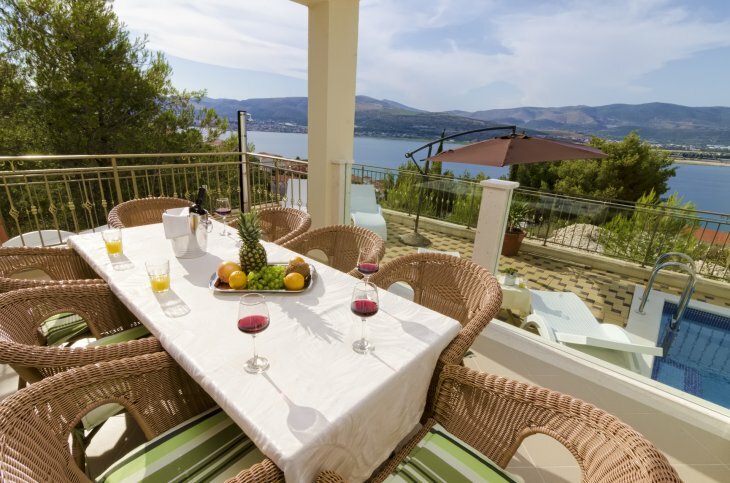 The terrace is equipped with a table and chairs where you can enjoy the sunny days of summer and pleasant summer nights. 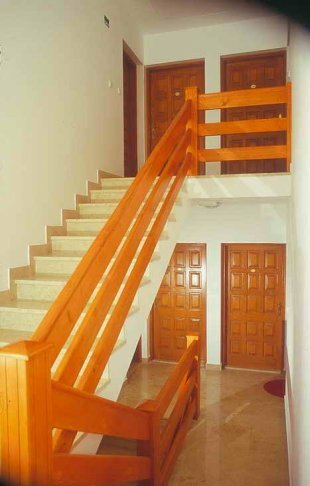 The interior is divided into three floors. 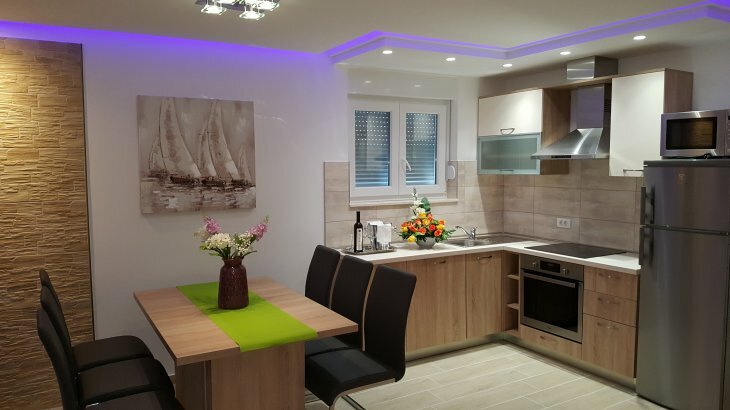 The ground floor features a living room with dining area and a fully equipped kitchen with dishwasher, as well as three bedrooms and three bathrooms with spacious shower stalls and a washing machine. 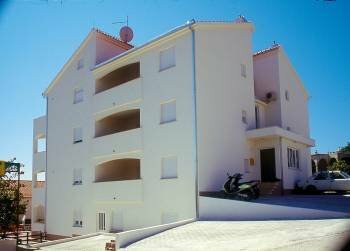 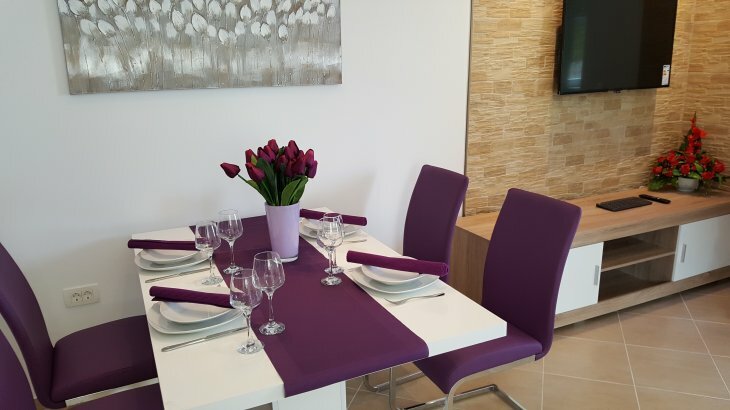 The first floor consists of two apartments with living rooms, dining areas and fully equipped kitchens with dishwashers, each apartment containing one bedroom, one bathroom with washing machine and a separate lavatory. 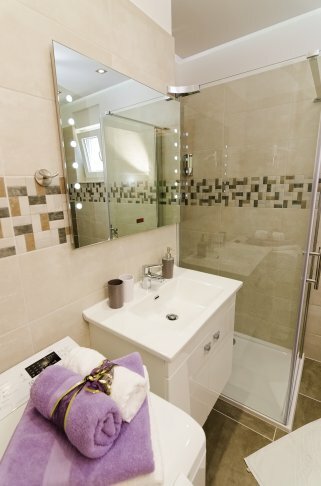 All rooms feature a king size bed (200 x 180 m) and an en suite bathroom. 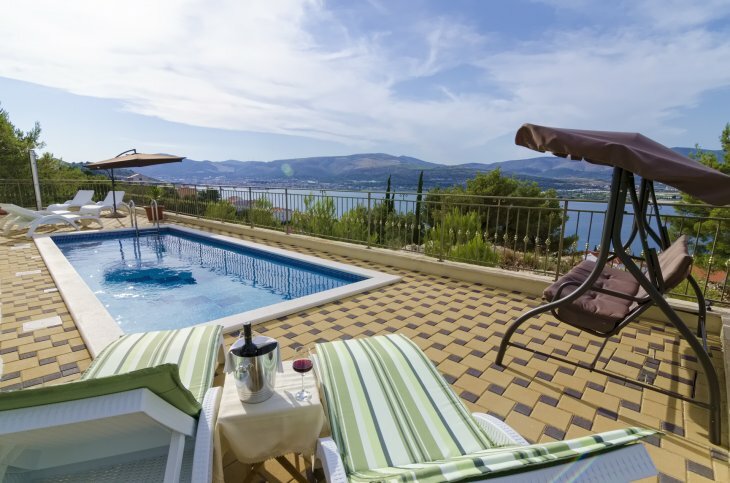 The living room leads you to a spacious, beautiful terrace with an outdoor sofa and sea view. 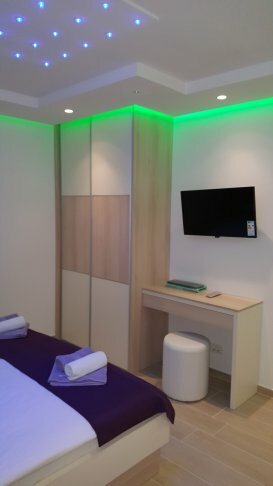 Each living room and bedroom contains a LCD smart TV with satellite television programmes, DSL access and an additional Wi-Fi connection. 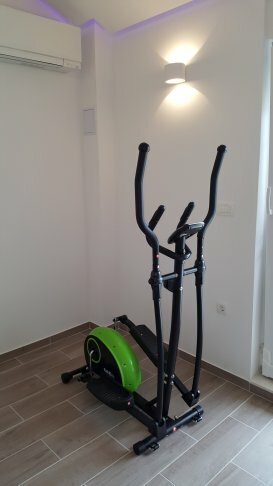 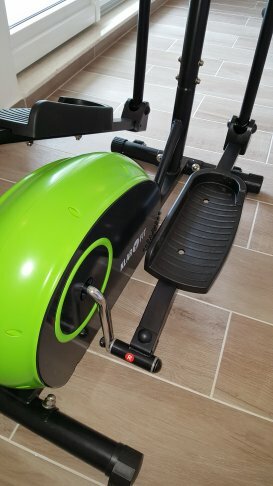 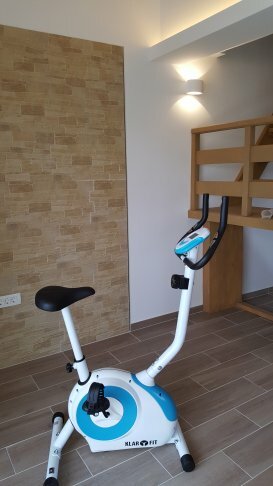 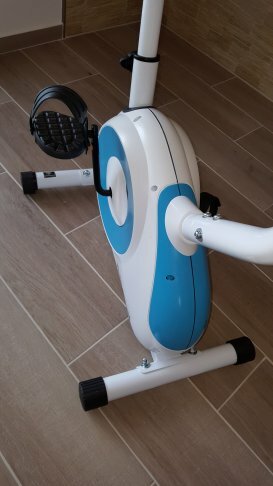 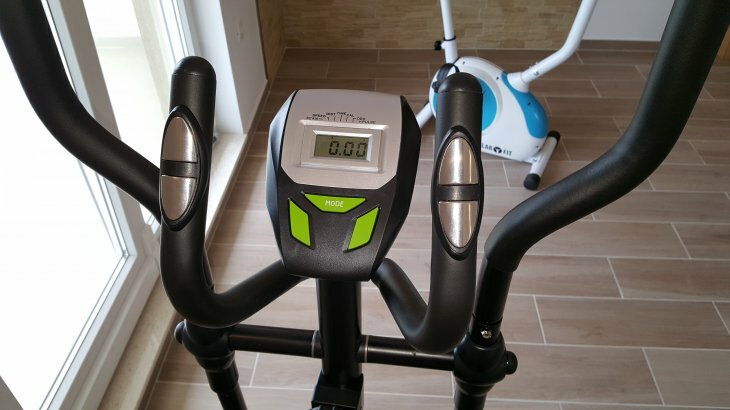 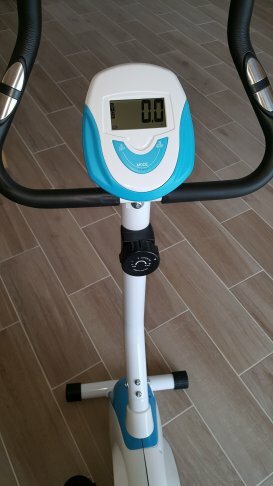 The attic has a small home gym, ideal for light exercise and relaxation. 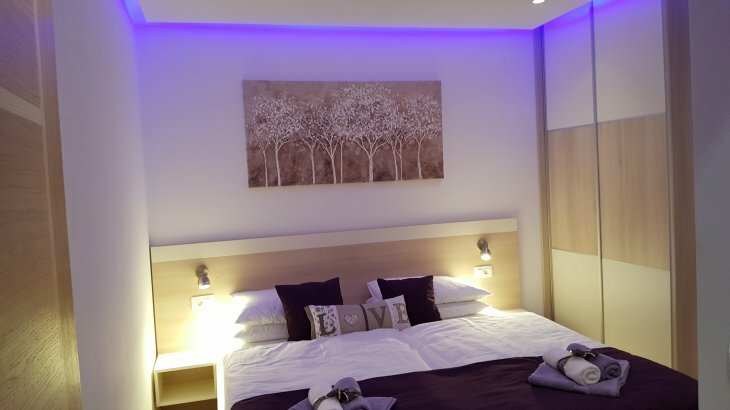 The special, pleasant ambience of the villa is enhanced by state-of-the-art direct and indirect LED lighting in different colours, available in all the rooms of the villa. 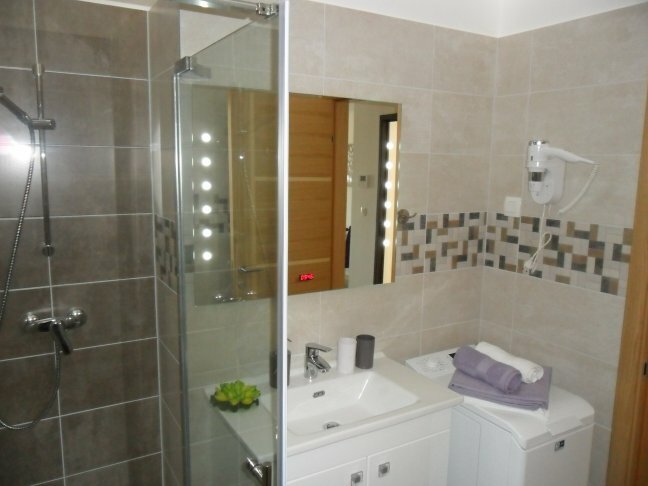 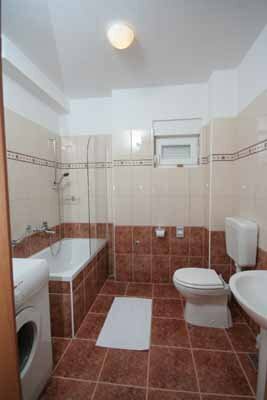 This holiday home is fully equipped with all the necessary facilities. 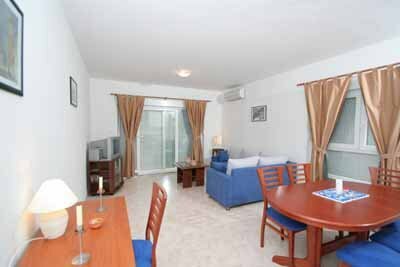 All rooms have air conditioning with heating and cooling systems and the bathrooms also feature built-in underfloor heating. 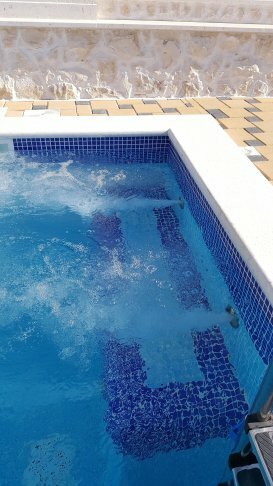 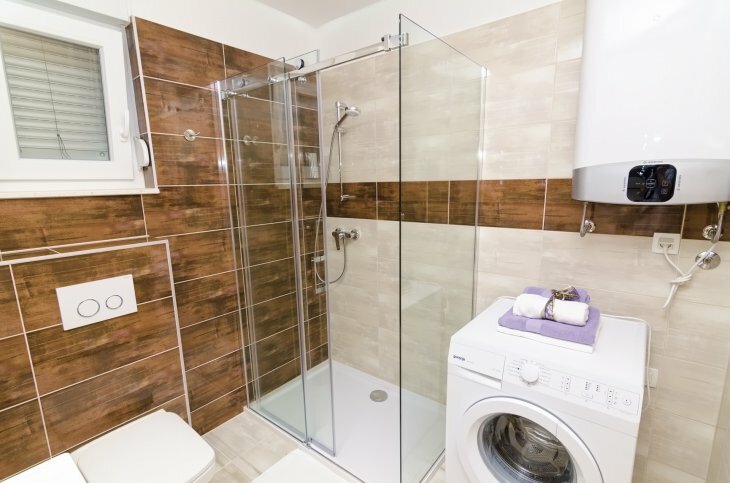 The guests have bathroom towels, bedding, extra towels for the sun loungers next to the swimming pool and a washing machine at their disposal. 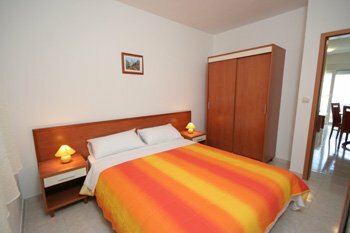 The bedding is changed once a week, and the towels changed daily or more frequently if requested, at a surcharge. 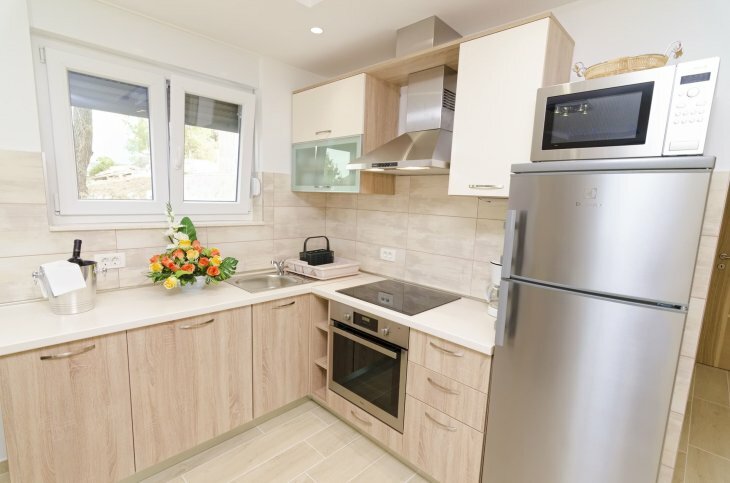 At your request and for an additional charge, we can organise grocery shopping for you, as well as various day trips, boat rentals, guided city tours and car rentals with or without driver. 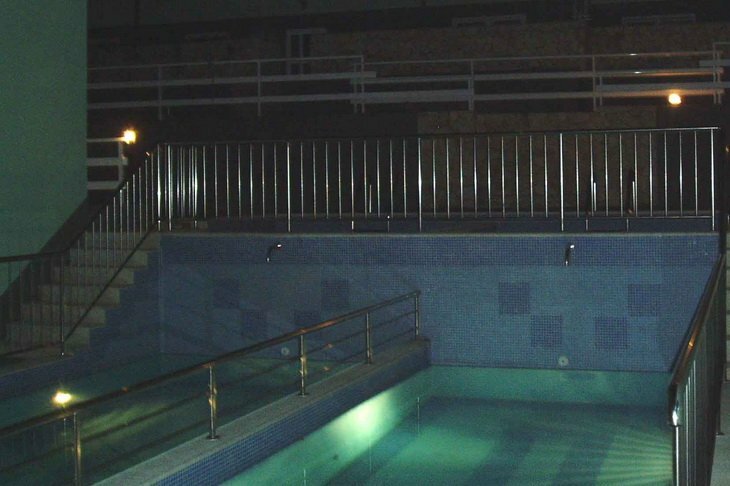 Enjoy our relaxing treatments and therapies that will fill in fresh and revitalizing energy. 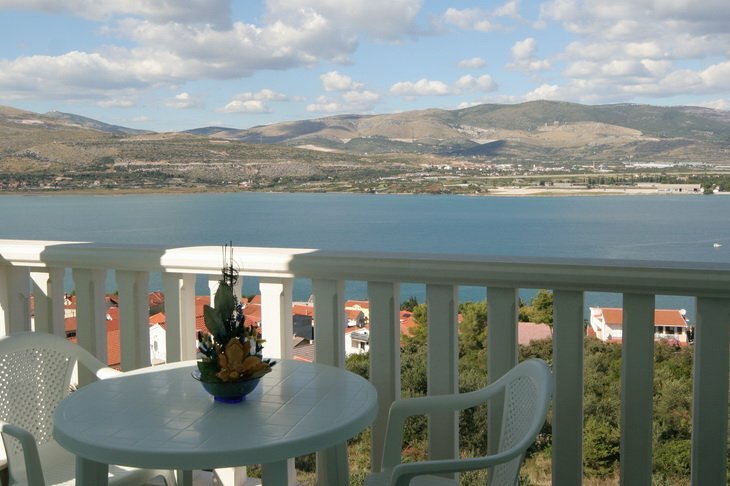 Even before the arrival or during your stay, book one of the vehicle from our offer.